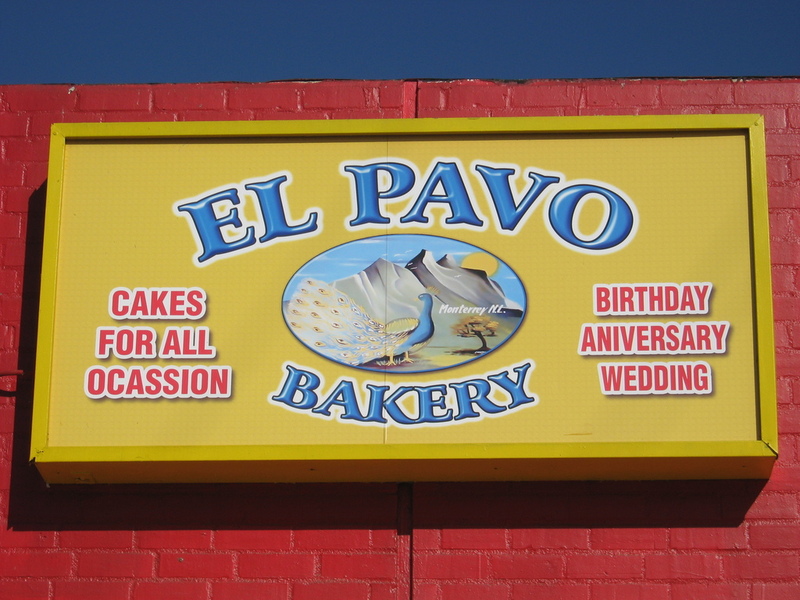 Since it’s Thanksgiving weekend, it seemed appropriate that today’s bike ride should be the route that ends up at El Pavo bakery. 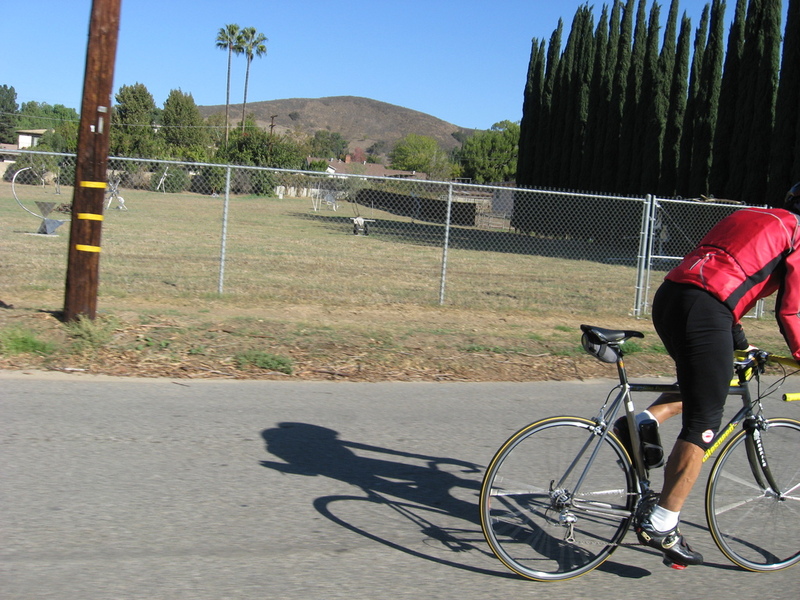 It was a perfect day for riding, and the route meandered around from Pasadena down almost to downtown L.A., and then back out on Huntington Drive all the way to Monrovia. For some reason that was not apparent, we were going especially fast today. We turned south into El Monte, and then west to get to El Pavo in San Gabriel. 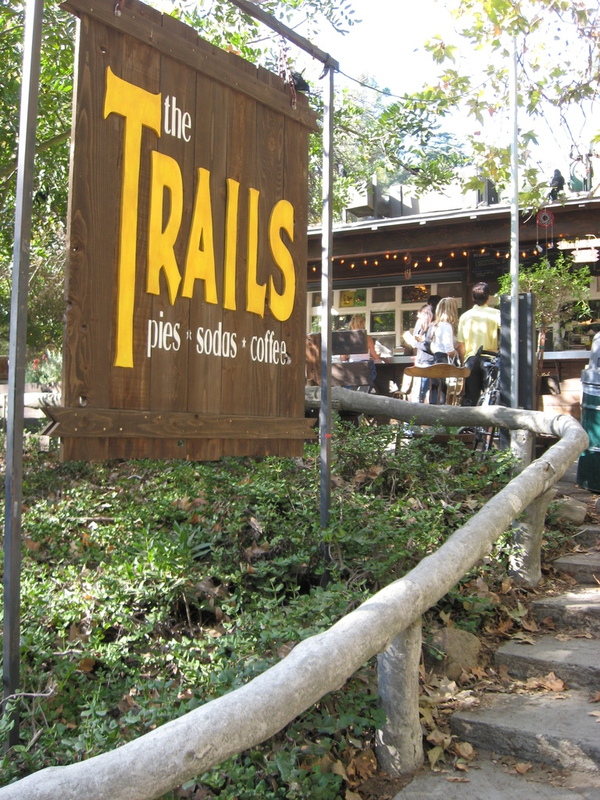 We stopped and had snacks there. I thought it was a bit amusing that the sign showed a peacock, which the dictionary tells me is pavo real, but the girl at the counter said that ‘pavo’ can mean any large bird. Before we left, we had a look across the street. 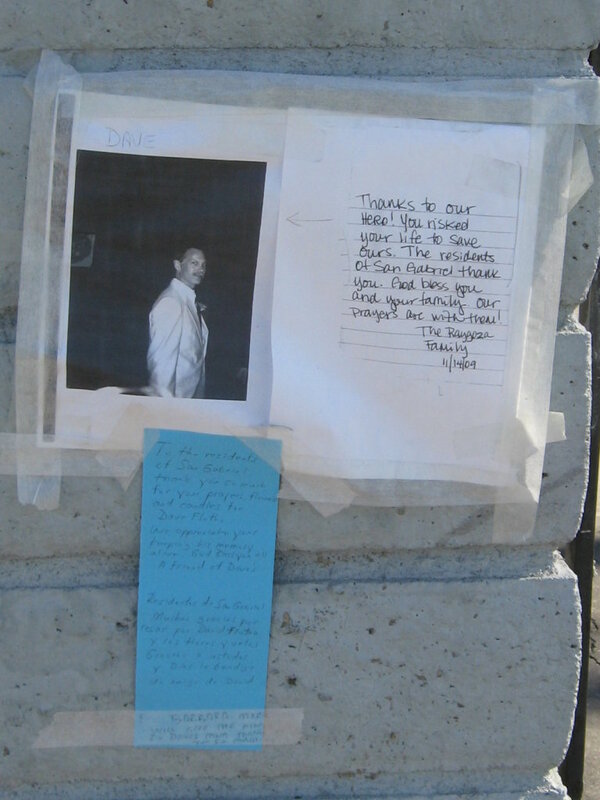 There was an impromptu memorial there for the pilot of a small plane that crashed there a couple weeks ago. The ride home was pretty straightforward. It had warmed up nicely, and it was very pleasant. On the day after Thanksgiving, Lucinda and I had some little adventures around San Diego. 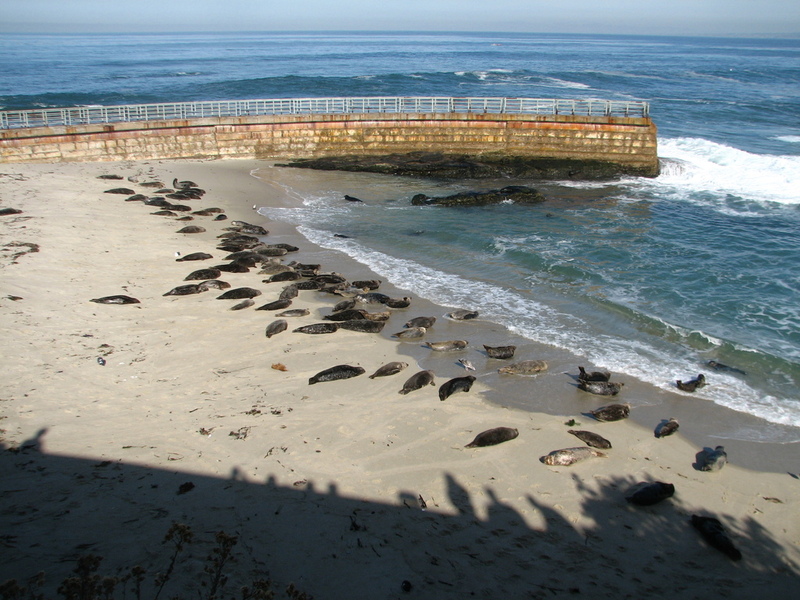 We started out at La Jolla Cove to see the seals. Then we went down to Mission Beach to ride the Giant Dipper roller coaster. After that, we went to Cabrillo National Monument to see the lighthouse and the tide pools. And finally, we went to Sea World. At the end of the day, we went back and had dinner with Grandpa before heading home to L.A. It was a long, but fun day. Pictures from the day are in Lucinda’s photo album, and also in my Nature and Animals collection. 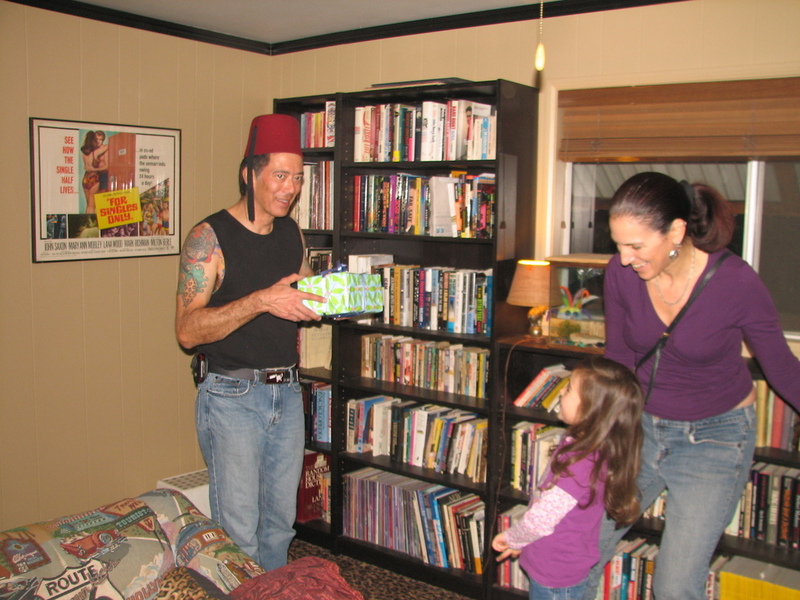 This year, I took Lucinda to San Diego for Thanksgiving to visit with my father. 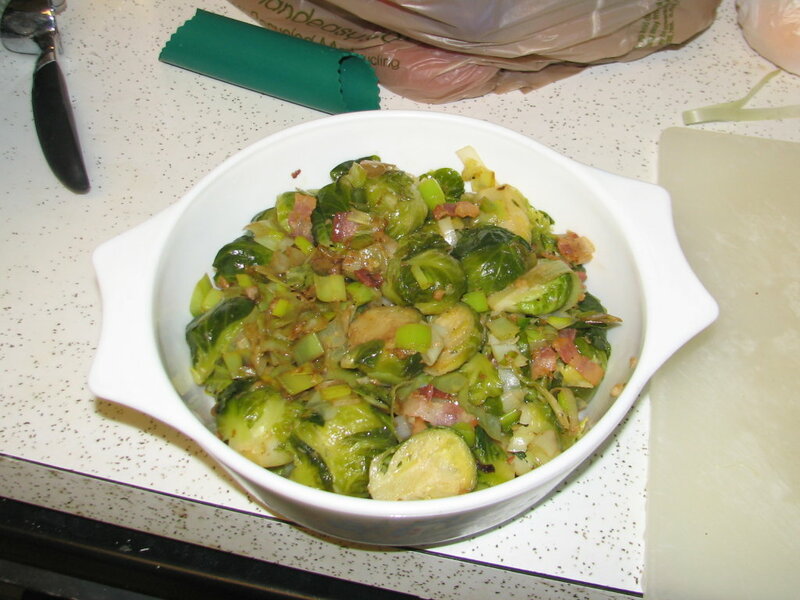 Our plan was to make a full traditional home-cooked Thanksgiving dinner in the kitchen of our room at the Residence Inn. I made several things the night before, and got more ready in the morning before we left. Then we loaded everything up in a big cooler and brought it down there. The trip was an ordeal, since it was heavy and slow traffic all the way from the El Toro Y down to Encinitas, which amounted to nearly half the total trip distance. So what should have a been a two-hour trip turned into nearly four hours. 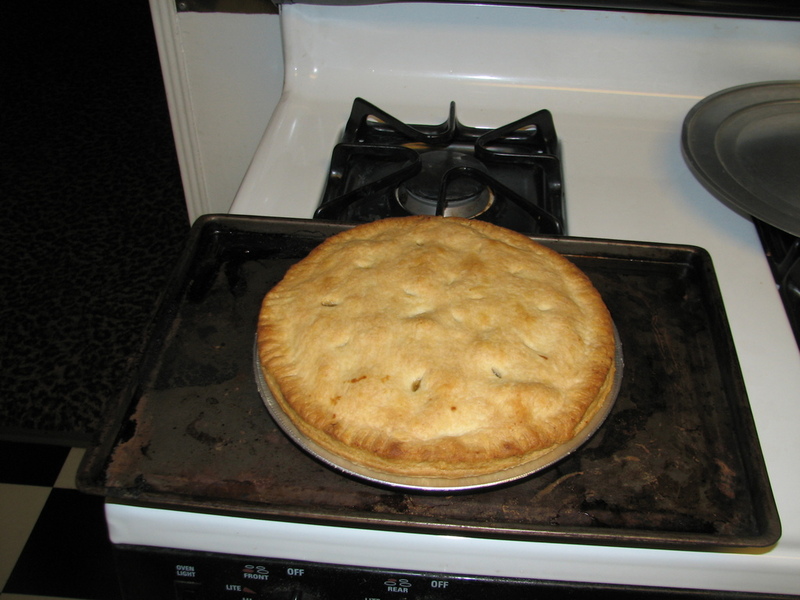 But we made it there just in time to put everything in the oven and still be able to have it all ready by 6:00. 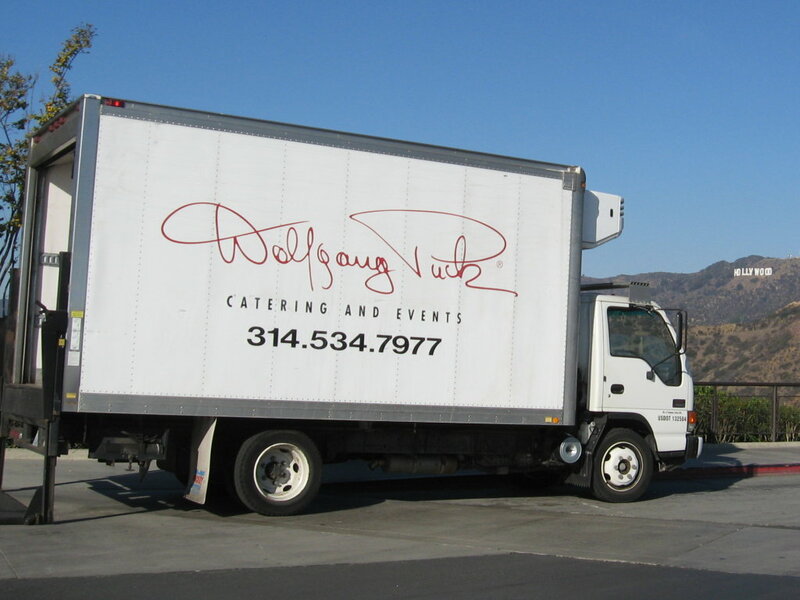 Once everything was cooking, we went and picked up Grandpa. And then we all came back to our room and had a Thanksgiving dinner that couldn’t be beat. It turned out that I’d only forgotten a few vital kitchen items, so everything turned out just fine. But next time, I will not forget to bring along containers to hold the leftovers. That turned out to have been a major oversight. 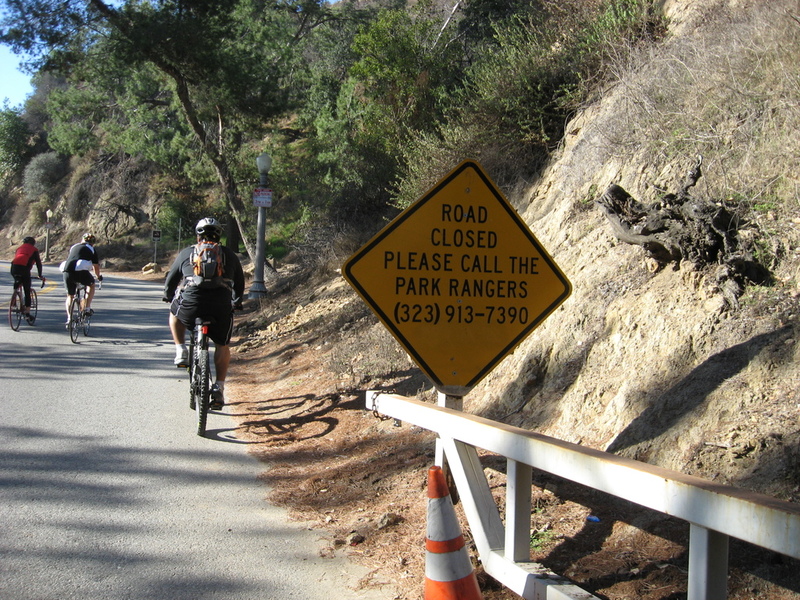 The route for today was a new one I’d cobbled together to go to The Trails in Griffith Park, and then over Mt Hollywood. It was a nice day for riding. A bit chilly in the morning, but it warmed up very nicely. 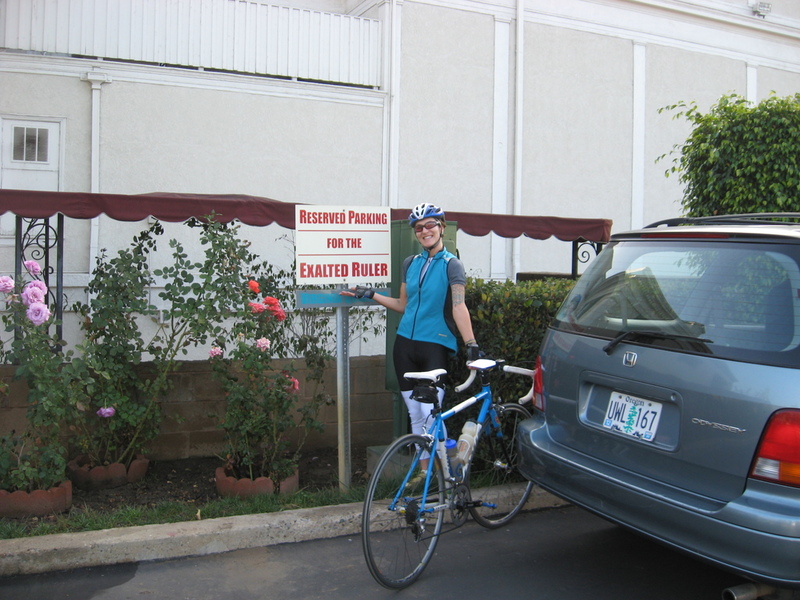 We started out from Victory Park and rode across the Colorado bridge and down into Eagle Rock. We took a short detour to look at Nolden St and contemplate trying Fargo St next spring. 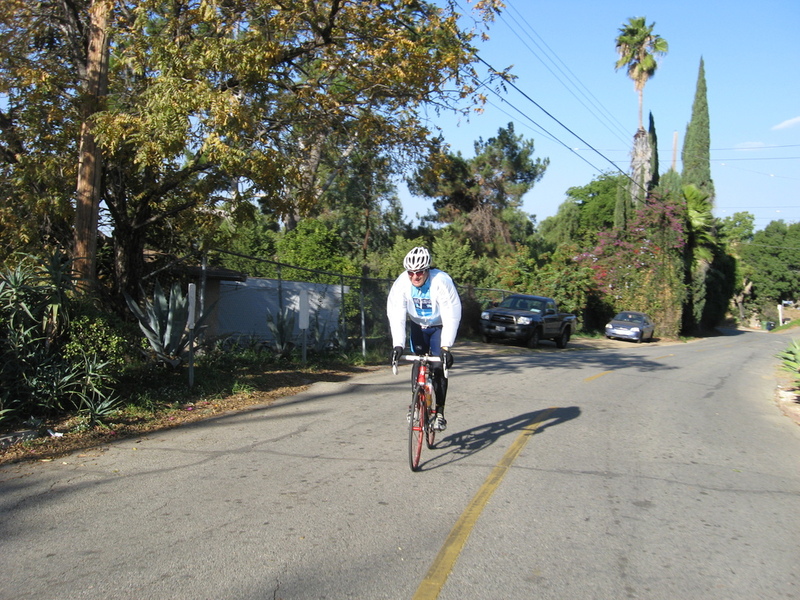 Then we rode down Eagle Rock Blvd to Atwater Village, across the Los Angeles River, and through Silver Lake to Griffith Park. The ride up to the observatory is pretty steep, and our group spread out a lot. 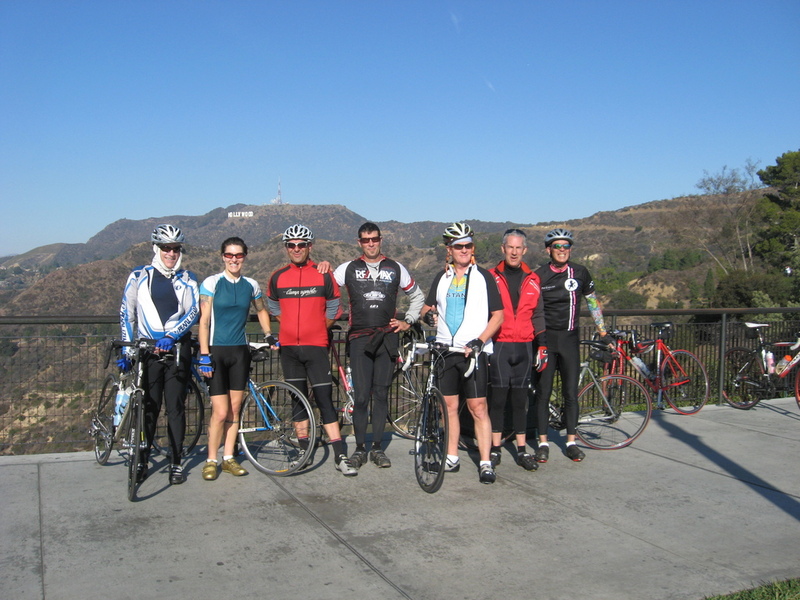 At the top, we regrouped and got a souvenir picture with the Hollywood sign behind us. Then we rode down Western Canyon Rd to The Trails. We found a bench in the sun and had some snacks and drinks. 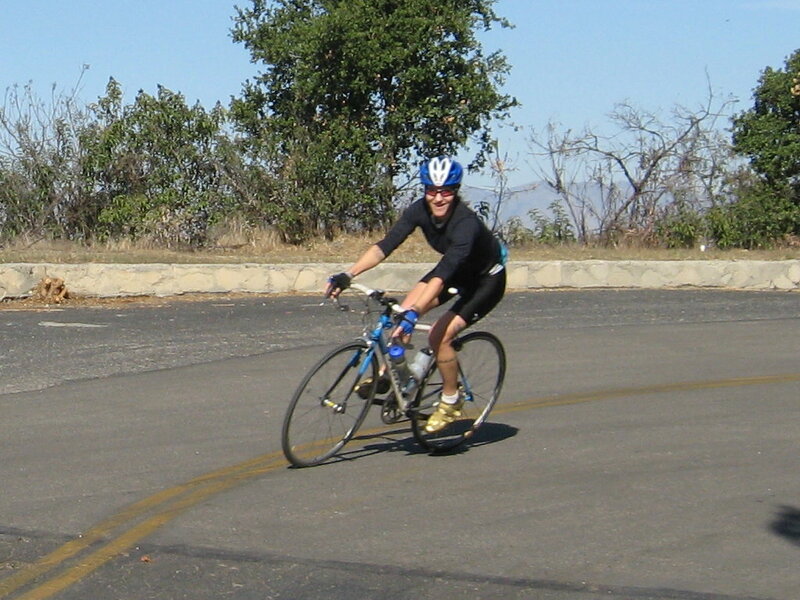 Then it was back up the hill and over Mt Hollywood Dr to the far side of the park. 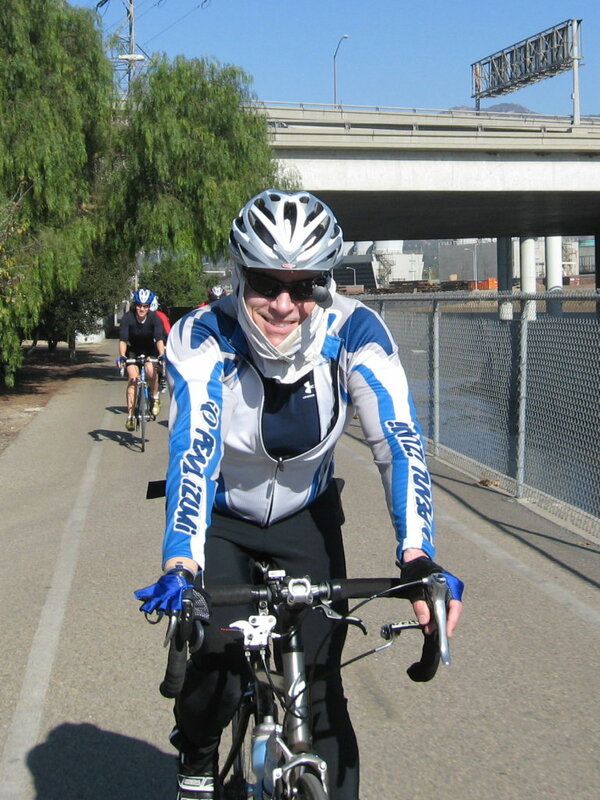 We rode around Travel Town to get to the L.A. River bike path, which took us back down to Fletcher. 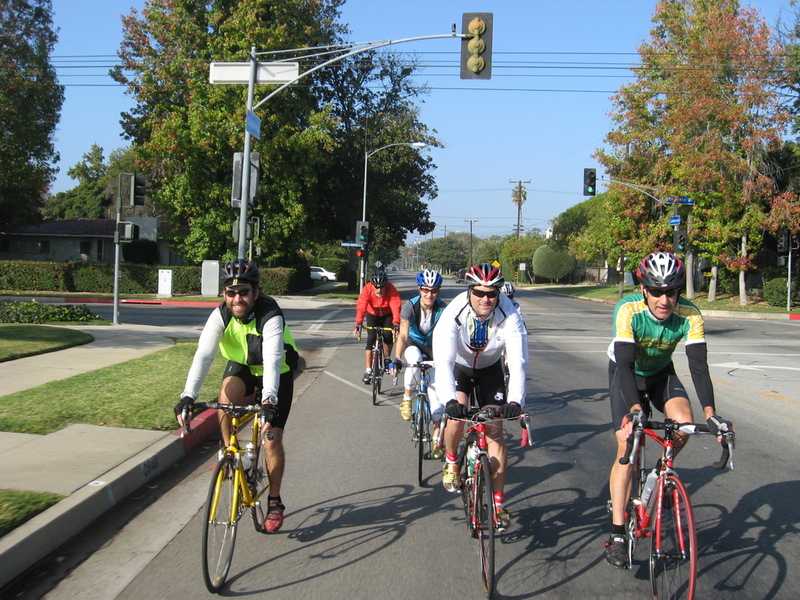 From there, we took Riverside all the way to where it crosses the river and becomes Figueroa St. Then we rode home by way of South Pasadena and San Marino. On the way home, I found a nice white couch abandoned on the side of the road. 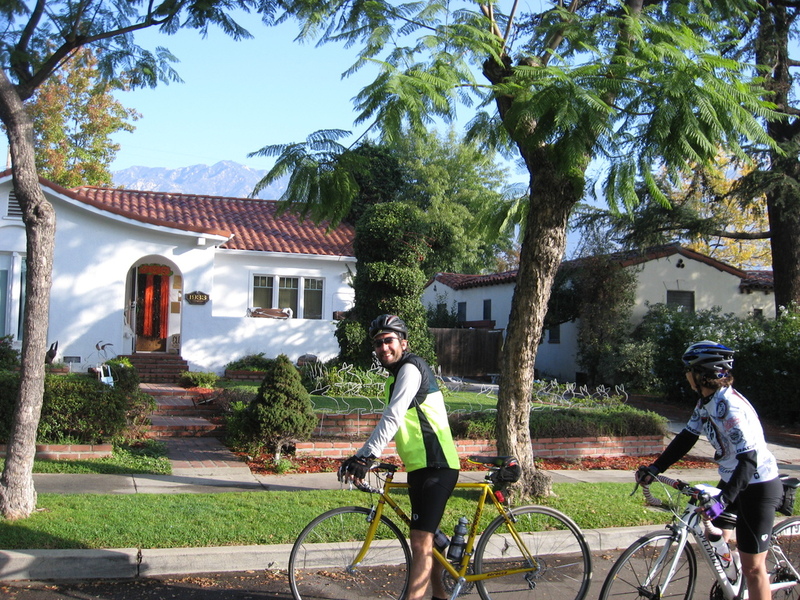 Today’s bike ride was up to Sunland to see a house that was mentioned in a talk I heard at Caltech about debris flows in the San Gabriel Mountains. 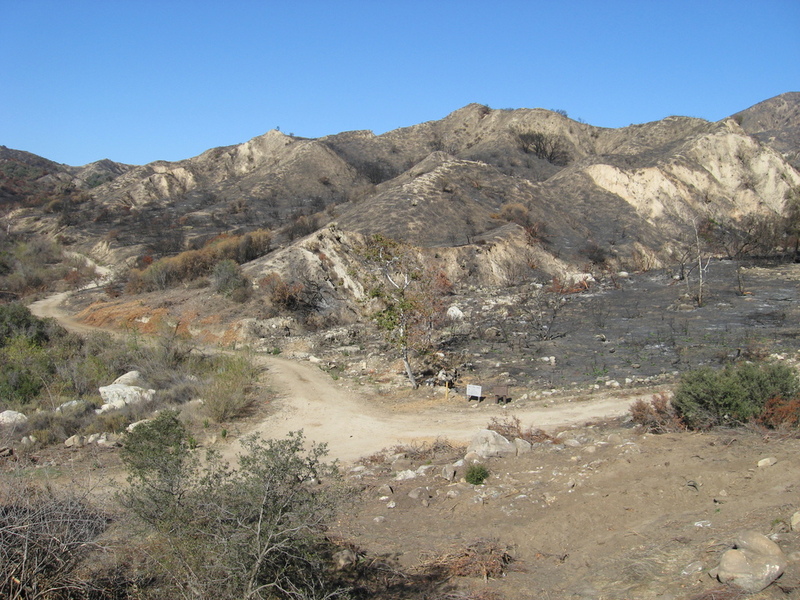 Debris flows tend to follow major fires, and the Station Fire this summer certainly qualified. The scientist giving the talk said that this particular house had been destroyed in 1978, and then it was rebuilt in the same spot. They expect that the chance of it being destroyed this winter is close to 100%. So I thought this might make for an interesting outing for the bike club. 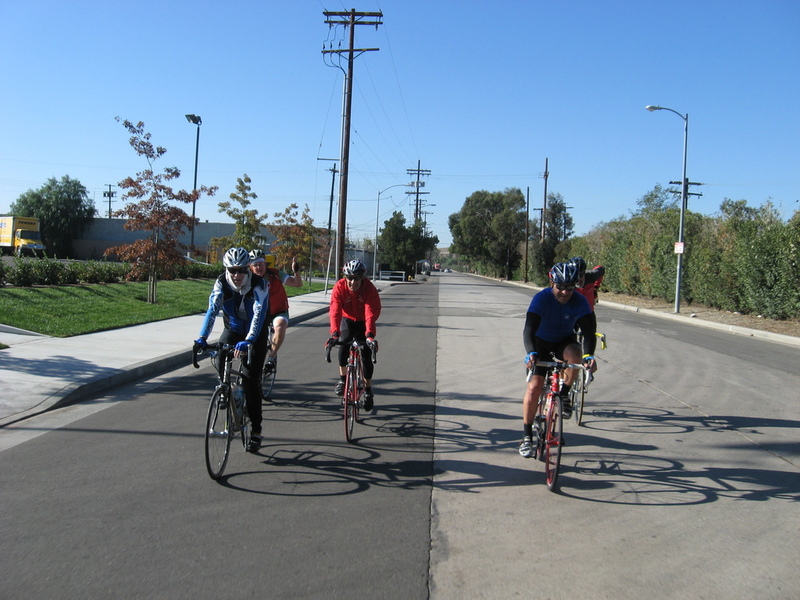 We rode out across Eagle Rock, Glendale, and Burbank, and then turned north into Shadow Hills. Along the way, we saw horses, and also a sculpture garden. 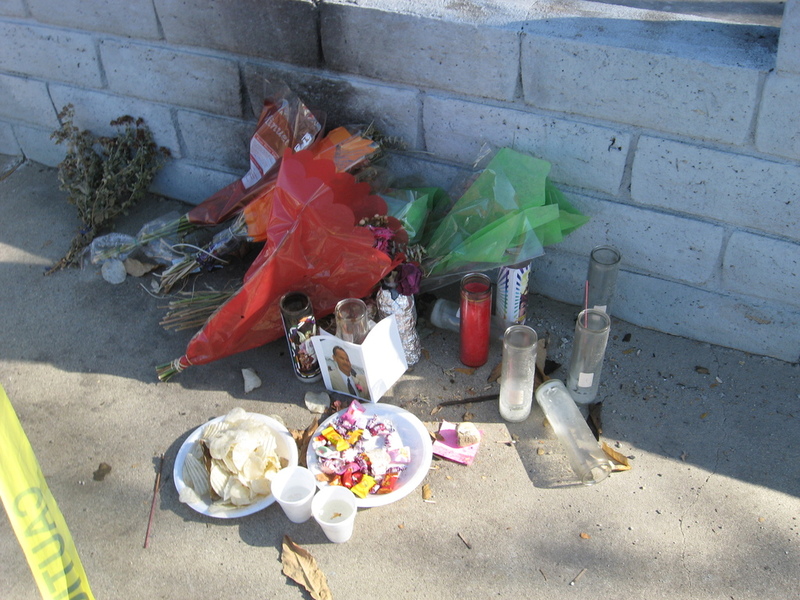 Then we came out on Sunland Blvd and headed north. 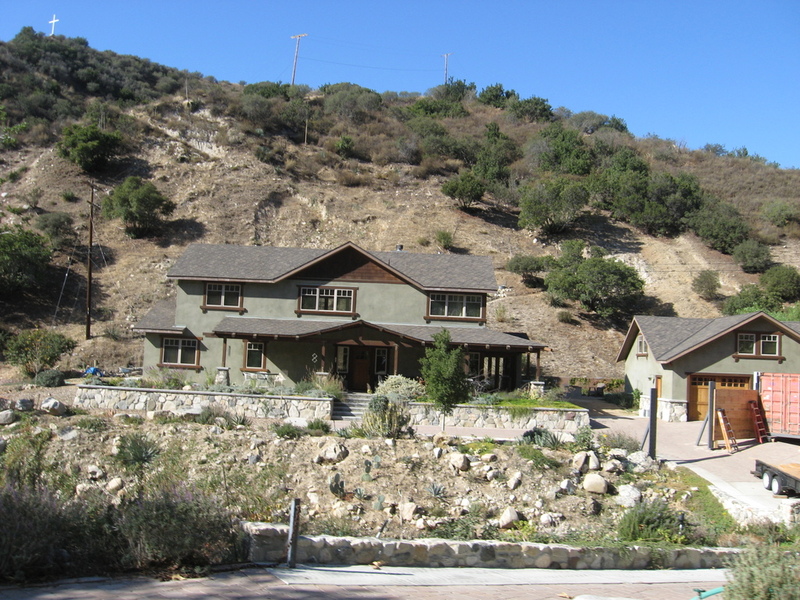 To see the house, we had to take a small detour into the mouth of Big Tujunga Canyon. The house sits in a small canyon just west of the main wash. There are two canyons that merge just above it, and it’s in a narrow portion of the lower canyon. So it’s easy to see how debris flows could come down and be concentrated right where the house sits. I suspect that the owners know this. In the picture of the house, it looks like they’ve installed some steel girders sticking up out of the driveway. They may be planning on putting up a deflection wall to try to guide the muck around the house. It will be interesting to see if that works. Coming back, we stopped at Goldstein’s Bagels and then headed home. It was a nice ride. This evening, I decided to make fried chicken for the first time in a long while. 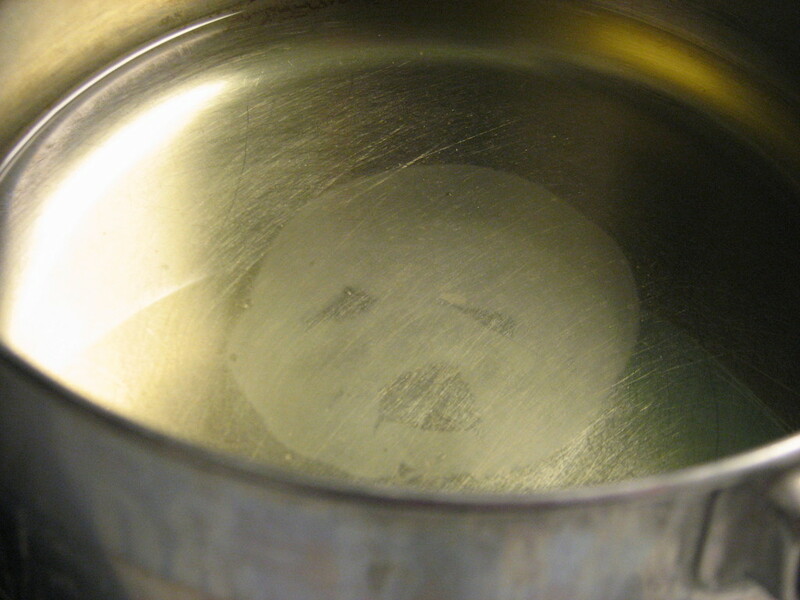 And when I poured the oil into the pan, I saw a face in the surface of the oil. It looked a lot like Edvard Munch’s “The Scream“. By the time I figured out how to position the camera to get a picture, it had morphed into something more like Mr. Yuk. But either way, it was a fine example of pareidolia. Lucinda was playing pinball today, and she rolled the machine over 1,000,000 points for the first time. The early electronic machines from the late ’70s only registered up to 999,999 points, so it was always a big deal to roll it over. When she set the high score a few weeks ago, I knew it wasn’t going to be long before she rolled the machine over, and I was right. She was quite pleased with her final score of 1,412,280. Today was a school holiday for Lucinda, so even though we’d just gone to Disneyland two weeks ago, I told her I’d take her again. As always, we started out in California Adventure. We rode the rockets, Mulholland Madness, and the jellyfish rides. 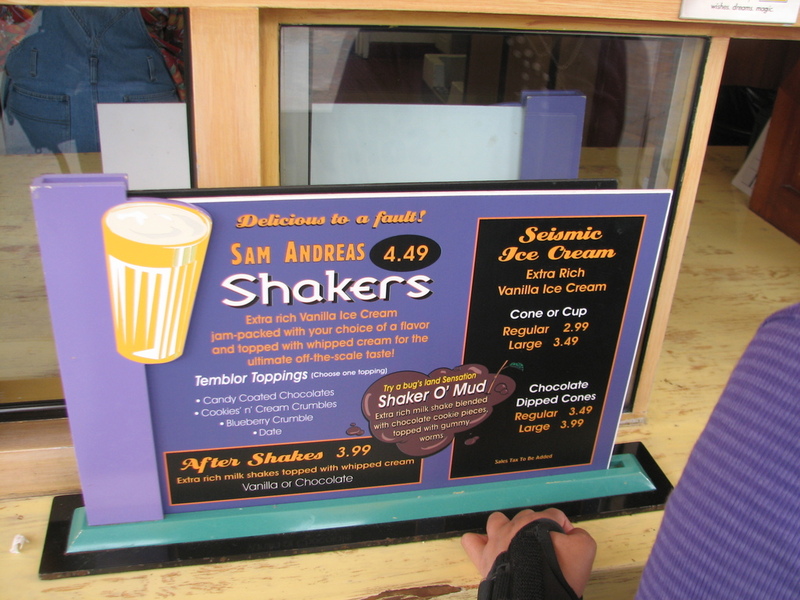 Then we had lunch and got some soft-serve ice cream before heading over to Disneyland. We hadn’t realized it, but apparently Veterans Day is a big school holiday, so every high school kid in southern California was at Disneyland. It was as crowded as we’ve ever seen it. So instead of riding the Pirates of the Caribbean first, we headed straight for Big Thunder Mountain. Lucinda rode that last time and liked it. Alisha was a little apprehensive at first, but about halfway through the ride, I heard her yelling something like, “This is awesome! Let’s do it again!” So when we got off, I was glad that I’d gotten us Fast Passes for it. We were able to just walk back around and get right back on. There’s nothing quite like riding a roller coaster with two ten-year-old girls. There is a lot of screaming. I’ve not traditionally been one to not hold on and put my hands up in the air on these rides, but I had to this time. Just so I’d have my hands free to hold my ears. Next time, I’m bringing earplugs. After that, we went and rode the Matterhorn. The line was pretty long for that, and they didn’t have Fast Passes for it. Then we did Star Tours, which is my personal old favorite. Then we walked back to do Big Thunder Mountain again. Along the way, we stopped and picked up passes for Space Mountain, but they turned out to be useless, because they were for 9:40 that night, and there was no way we were going to still be there that late. So when we went to Big Thunder Mountain, I talked to the people running the line there, and they gave us a pass that was good for any one ride in the park, and they also let us do the Fast Pass line for Big Thunder Mountain again. So we rode that two more times for a total of four for the day. Next, we walked to Toon Town to ride Gadget’s Go Coaster. Lucinda thinks this ride is kind of tame now, but was the first coaster she rode, back in August. So it’s something of a sentimental favorite. By now it was dark and starting to get cold. We decided to use the pass they’d given us at Big Thunder Mountain to do Space Mountain. Lucinda was nervous, but we were able to calm her down and get her on the ride. And she loved it. 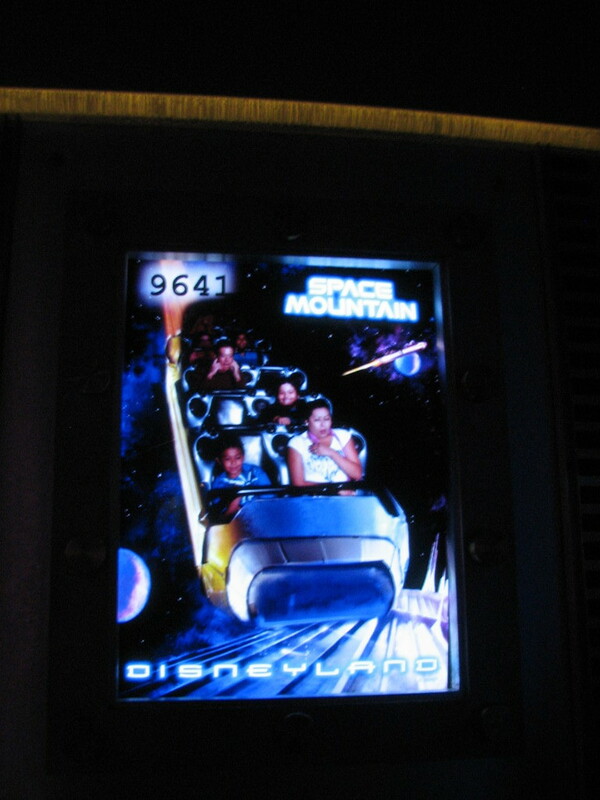 Since that ride is completely in the dark, I couldn’t get any pictures, but there was a lot of screaming. They take pictures of each train right at the end, and our picture showed me sitting and holding my ears. Like I said, next time I’m bringing earplugs. It was a very fun day. After the requisite stop at the gift shop, we went and had dinner at the Jazz Kitchen. We got our picture there, so I can add it to my track-my-progress collection. The rest of the photos are in her album. I’m not generally one for big birthday parties. But this year was special. It’s a big round number with a zero on the end. And I get to join AARP now. So it seemed worth a party. 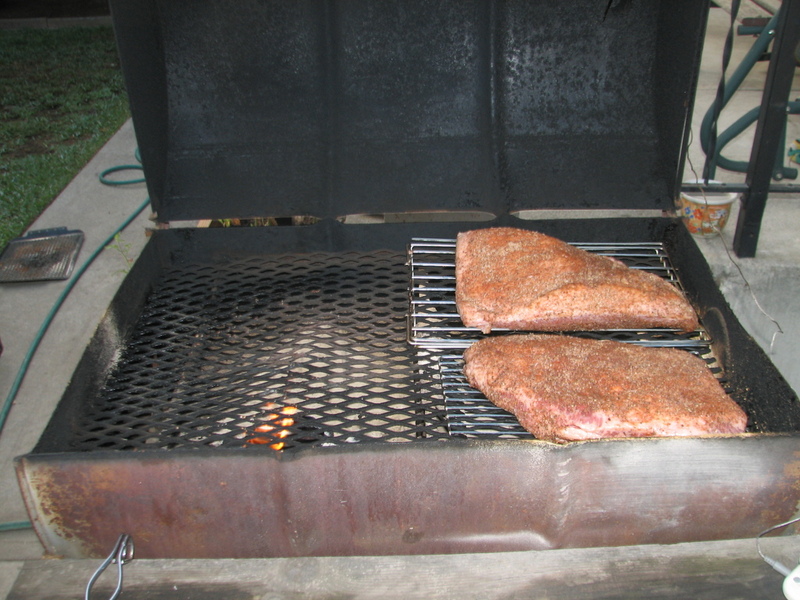 I got two briskets from HOWS market and spent all day Saturday smoking them over an oak fire. 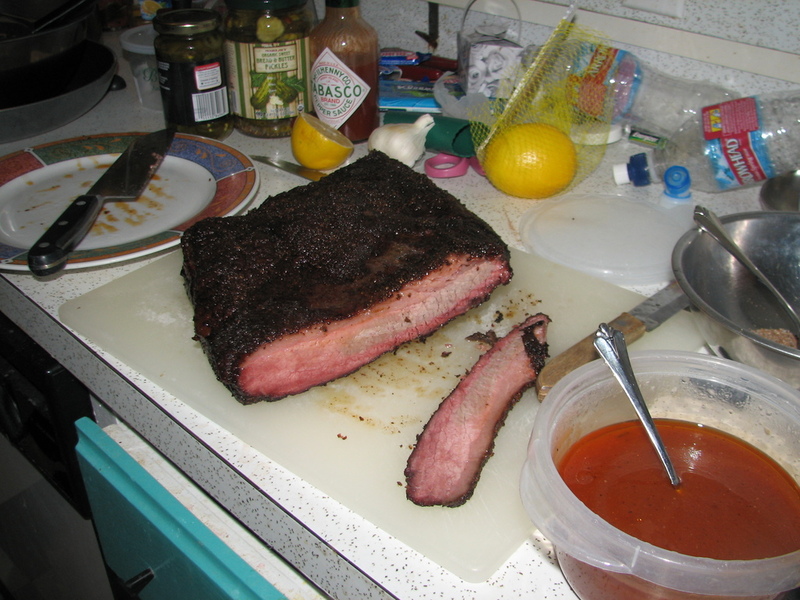 Since I decided I no longer hate Texas, it seemed appropriate to have central-Texas-style barbecue at my party. And it turned out quite well. Lucinda isn’t used to having large numbers of people in our house, but she adapted all right. 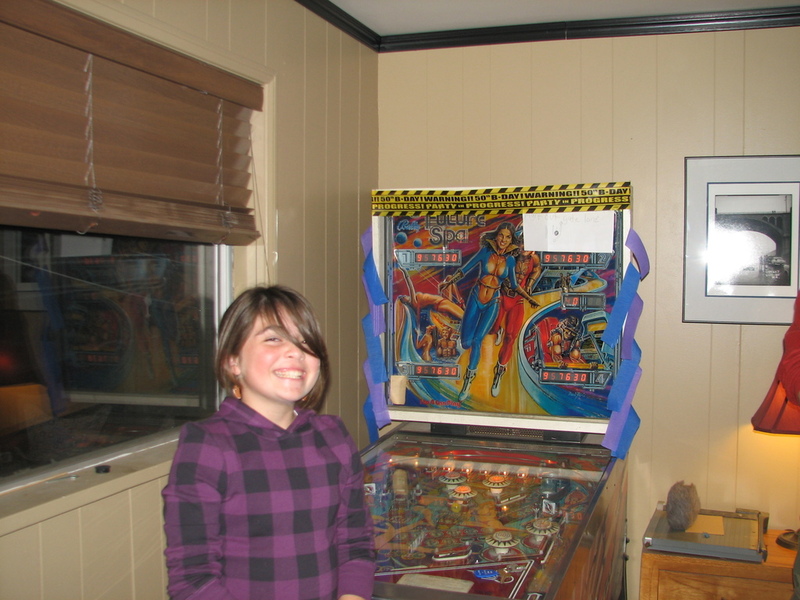 And she beat everyone at pinball. She even set a new high score tonight. It was fun having all my friends over, and my tattoo artist Shannon did a special belly dance and gave me a certificate for a free tattoo session with her. Overall, it was an excellent way to mark a half-century. 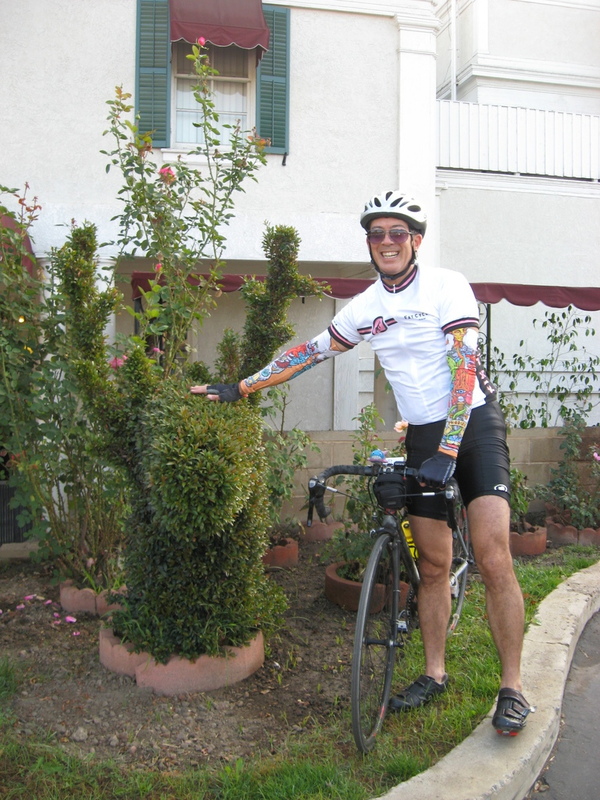 Today’s bike ride was a tour around the San Gabriel Valley to see examples of topiary. I’ve been collecting photos of these sorts of things for a while, and I decided to put then all together into one ride. The first stop was the topiary rabbit at the Bunny Museum. 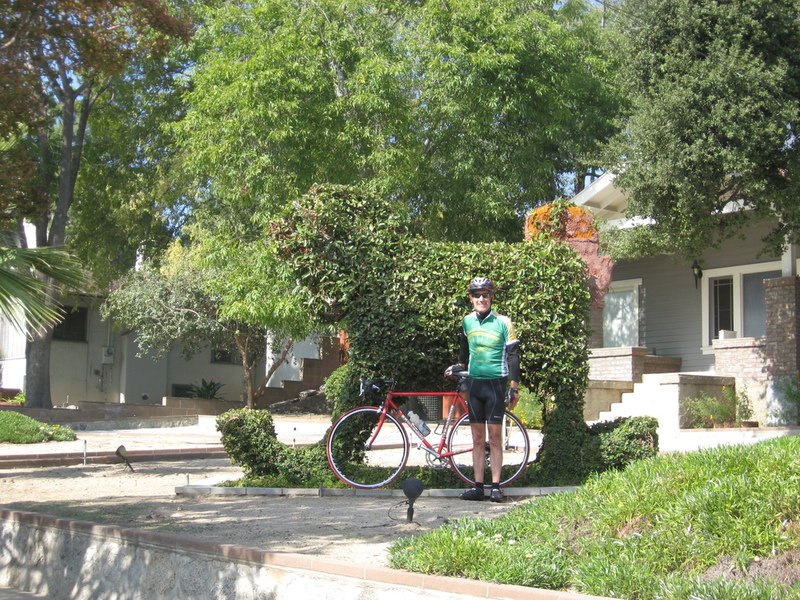 Then we rode to the Pasadena Elks Lodge to see the topiary elk’s heads by the front door. Next was the topiary Pegasus at the Mobil station on Lake Avenue. This one is not well-kept, so it’s kind of a lame topiary. 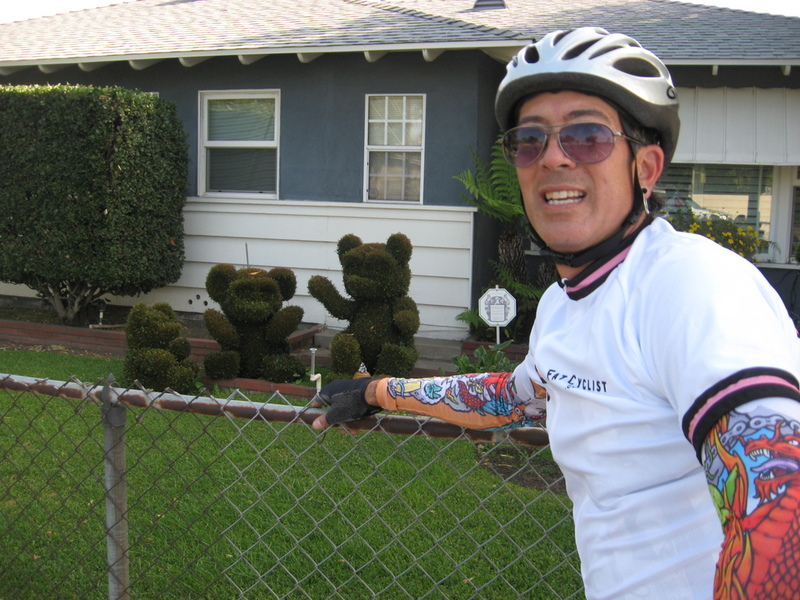 After that, we rode out to Glendora to see the topiary teddy bears. Along the way, Sage got a flat. This is her first appearance in the Flat Tire Gallery. 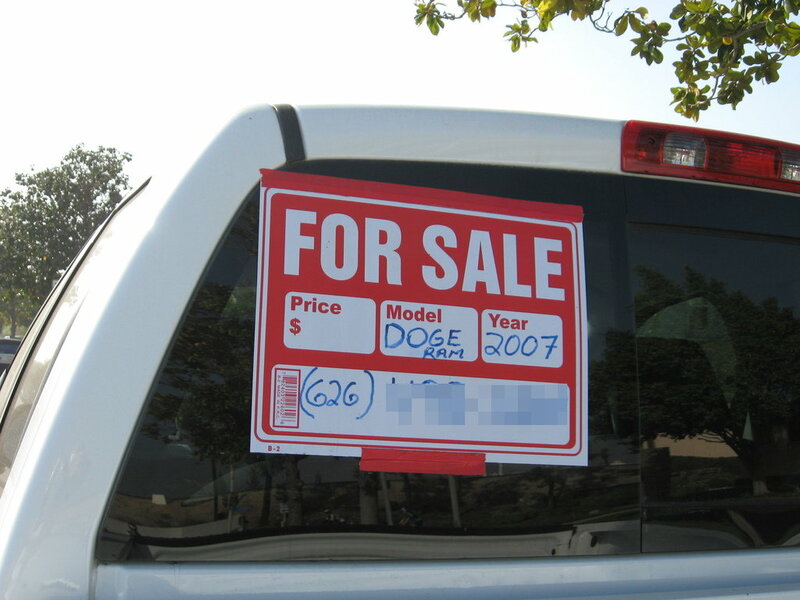 We also had a laugh at the “For Sale” sign on a Dodge truck. After all, how hard is it to spell “Dodge” when it’s right on the side of the truck? 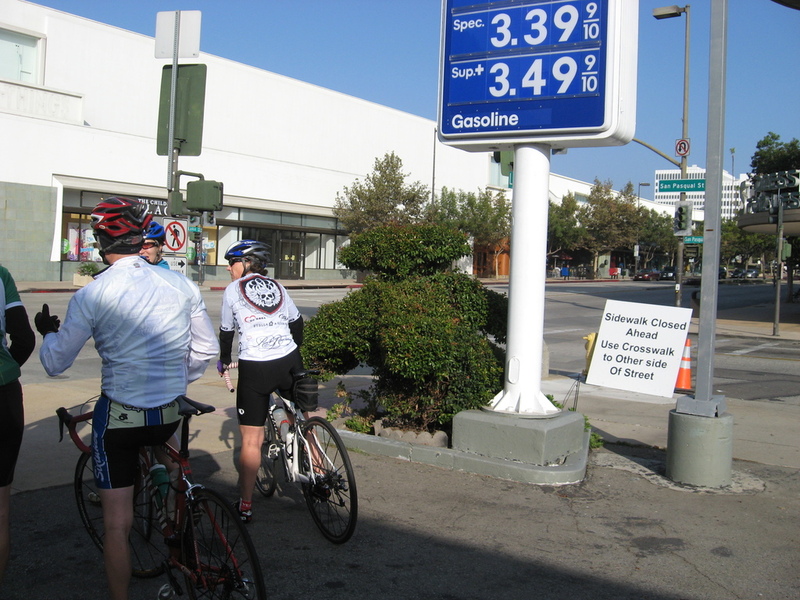 Our snack stop was at Classic Coffee in Glendora. Then we headed home. Along the way, we saw Vikki, and I got to talk to her for a bit for the first time in a while. 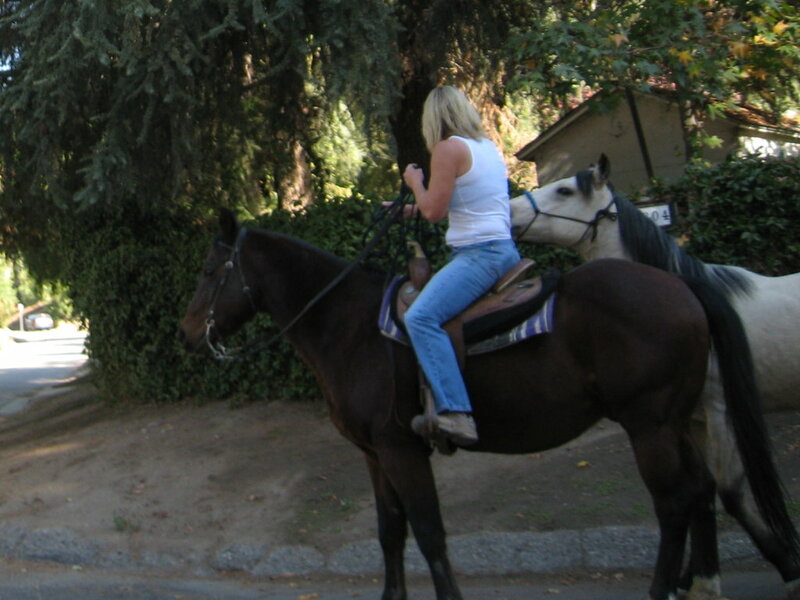 The last topiary was a rocking horse in Sierra Madre. And then we rode back to the park. It was a nice ride.